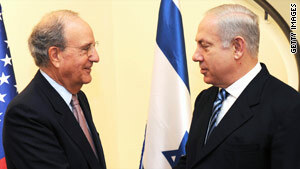 Israeli Prime Minister Benjamin Netanyahu (right) speaks with U.S. Middle East Envoy, George Mitchell. JERUSALEM (CNN) -- U.S. President Barack Obama's special envoy to the Middle East ended a four-day trip to Israel and the West Bank with no breakthrough in persuading Israelis and Palestinians to go back to the negotiating table. George Mitchell met Sunday morning for a second time with Israeli Prime Minister Benjamin Netanyahu. After the meeting, Netanyahu told his Cabinet that Mitchell had shared "a few interesting ideas for the renewal of the process. We are are interested in doing that and I expressed my hope that these new ideas would enable the renewal of the process. "Of course if the Palestinians express the same readiness we will find ourselves in a process and that is an important thing for them and for us and for anyone that aspires to advance peace and reconcilement in our area." And at a planting ceremony in Kfar Etzion, a settlement outside Jerusalem, Netanyahu reiterated that the Gush Etzion settlement bloc will be Israel's forever. "We will stay here, we will build here, this place will be an inseparable part of the state of Israel forever," Netanyahu said. He added, "Surrounding this issue there is great national consensus in Israel and the recognition of this is slowly seeping into the international realm." Mitchell met on Friday with Palestinian President Mahmoud Abbas who despite American pressure has refused to re-enter negotiations with the Jewish State until it agrees to halt Israeli construction in the occupied West Bank and in East Jerusalem. The Palestinian chief negotiator, Saeb Erakat, said the resumption of talks was not in the offing. "We do not have the conditions to resume negotiations when we say a settlement freeze that includes east Jerusalem. That is not a Palestinian condition, it is an Israeli obligation. And the same thing is applicable to our demand to resume negotiations where we left them in December 2008." Mitchell's latest efforts to restart the stalled peace process were complicated by Netanyahu's demand that Israel maintain a military presence along the West Bank's border with Jordan. In remarks to the international media Wednesday, Netanyahu said any peace deal with the Palestinians would "require an Israeli presence on the eastern side of the prospective Palestinian state" to prevent the smuggling of rockets into the West Bank. Under current agreements between Israel and the Palestinian Authority, Israel maintains full control over West Bank and its borders, while the Palestinian government oversees administration of major population centers. Erakat slammed the Israeli leader's remarks, saying Netanyahu was sabotaging a two-state solution by trying to dictate the outcome of negotiations. Negotiations between Palestinians and Israelis have been stalled for more than a year, despite the Obama administration's attempt to move toward a resolution of the decades-old Israeli-Palestinian conflict. In an interview published Thursday in Time magazine, Obama acknowledged that the effort "is not where I want it to be." "This is just really hard," Obama said. "Even for a guy like George Mitchell, who helped bring about the peace in Northern Ireland. This is as intractable a problem as you get." He said both the Israelis and Palestinians face strong political pressure to avoid "meaningful" talks, "and I think that we overestimated our ability to persuade them to do so when their politics ran contrary to that." "I think it is absolutely true that what we did this year didn't produce the kind of breakthrough that we wanted, and if we had anticipated some of these political problems on both sides earlier, we might not have raised expectations as high," he said.